This recipe was inspired by a delicious lunch we had last year at Towpath – a seasonal café on the canal in East London (closed over the winter months sadly). The dish was a smoked fish curry and got us excited to get back to the kitchen and create our own version. Funnily enough our lunch to Towpath was followed by a visit to our friend Max who has just set up The Secret Smokehouse – who smokes trout, salmon, kippers and haddock under the arches in Hackney. He started a few years ago just smoking fish in his garden shed in Stepney using the traditional method of using oak chips for his smoking – since has grown simply because it is the best and is now under demand from some of the best restaurants in London (you can also buy straight from him). Apparently smoking fish all started there in the East End and Max is passionate about staying true to the tradition – adding nofancy extras, sugar or colouring. We tried all his produce – delicious and came away with an armful of goodies. 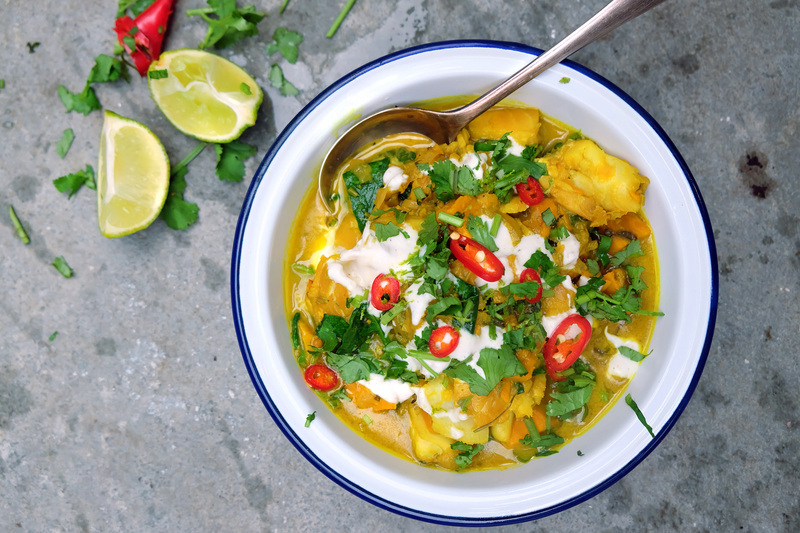 Back in the kitchen we wanted to make a dish that was fragrant and light staying away from a heavy curry that makes you feel slug-like after eating – this is a good one for lunch or dinner, and would suggest making extra as will keep well in the fridge for a couple of days. Turmeric is one of the key ingredients here, arguably the most powerful herb for fighting and potentially reversing disease and has been used in Asia for thousands of years in medicine. We use it in our immune boosting morning shots (lemon, ginger, turmeric, honey and cayenne pepper), Golden Milk is a winner if you feel a cold or sore throat coming on (heat coconut milk, turmeric, cinnamon, honey, black pepper). In all these recipes we juice fresh turmeric, but if you can’t find it then make a paste with mixing a little water with the powdered version – make sure you wear gloves as it seriously stains or you will end up with fingers that look like they belong to a filthy old smoker. 1. Heat the coconut oil in a pan then add the onion and garlic and sauté for a few minutes. Then add the ginger, chili, coriander stalks, coriander seeds, turmeric and lime leaves and continue to sauté for 5 minutes, stirring occasionally. 2. Add the sweet potato, fish sauce, white wine and coconut milk and bring to a simmer. Simmer for 12 – 15 minutes, till the sweet potato is soft. 3. Chop up the haddock into large chunks and add to the pot, stir carefully and cook for a further 4 – 5 minutes, add the lime, spinach and season. 4. Divide between bowls and serve with yoghurt, fresh chili, coriander leaves and lime.